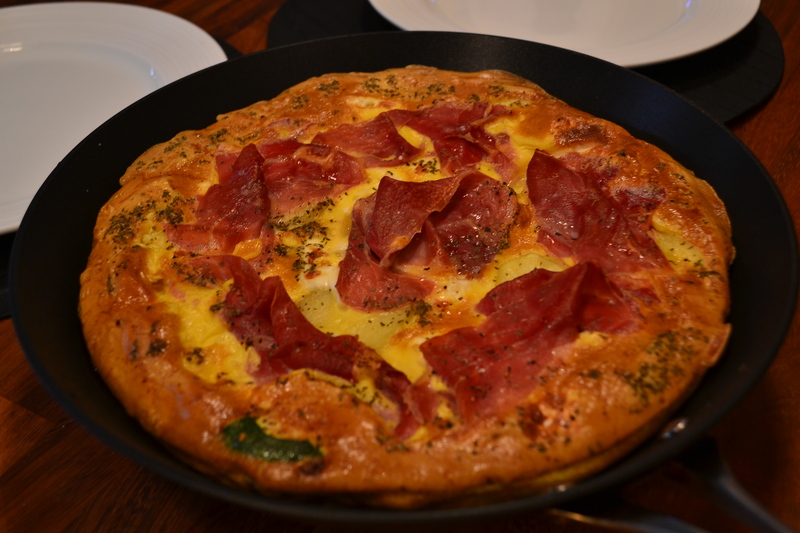 The Italian Frittata mark 2! Ok, ok, ok – so I spun up a pretty cool frittata this time last week….what can I tell you….I’m on an egg kick at the minute…and I love frittati. This time, I’ve kicked it up a gear and added Serrano ham and holy moly does it make a huge difference! Give this a shot because it might just put pizza on your endangered list! Kick off by frying the onion and courgette in a wide frying pan until fully cooked through, add the stock and reduce until gone. Make sure you cover the whole of the pan evenly with the onion and courgette when cooked. Arrange the spuds evenly on top of the onions and courgette and season with salt and basil then crumble over the Feta evenly.